Comments: First state record found on 2/20/12 by Nick Lund. Continuing nearby today, where it was relocated by Jeff Culler and Joe Hanfman. Studied and thoroughly enjoyed by dozens over the course of the day. 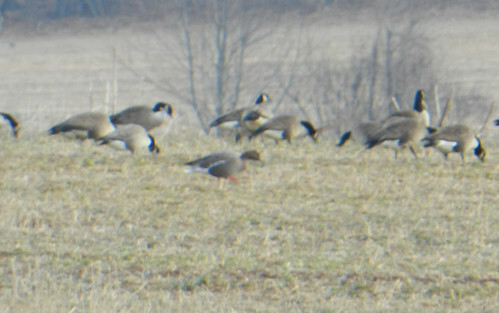 ID straightforward, noting all of the following: much smaller than surrounding Canada Geese; small pink bill dark at tip and base; lack of white front; brown head and neck darkest on face and becoming lighter down the neck; silvery gray upperparts; white line on flanks; distinctly pink legs; belly light-colored and lacking the dark "specklebelly" lines of GWFG; white undertail. Although former captivity isn't generally discussed as a major concern with this species, we observed and photographed the presence of both halluces. Note also the presence of five Richardson's Cackling Geese in the flock, which lends further support to natural vagrancy. (Again, not much of a concern, but noted for completeness.) Truly awesome!